On the 16th July 2016, I enjoyed a great day out at Fingask Castle at Rait in Perthshire. I was there to celebrate Lynn and Joyce's wedding and I took along my camera to get in some candid shots of the girls and the guests. 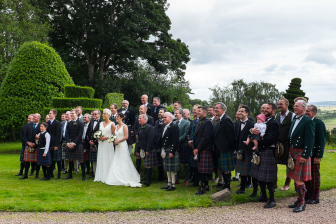 The weather was slightly overcast with some bright spells and it even managed to rain during the open air ceremony. I did feel more than a bit old as I watched my cousin Margaret's daughter Joyce getting married and it seemed like only yesterday that I was making silly faces and noises at Joyce in her pram at the Port Seton Gala.